It was good to see the Vancouver Jazz Festival include a "mini-orchestra" like Portland, Oregon's Pink Martini in this year’s programme. 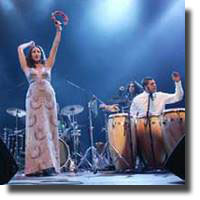 The band’s musical style is a potent mix of cosmopolitan jazz, Cuban-fusion, orchestral and new age. Opening with Ravel's Bolero, the audience exploded into applause after the few opening notes of Nicholas Corosa’s violin. Following this opener, bandleader and pianist Thomas Lauderdale introduced singer China Forbes. The exotic Ms Forbes, dressed in a small black coctail dress, provides an elegant counterpoint to Lauderdale’s eccentric kitsch, who comes across as an even more animated version of Elton John, frequently resetting his eyeglasses between notes. Forbes enthralls her audience singing in multiple languages that includes Italian, French, Portuguese, Japanese, Mandarin and even Arabic. Lauderdale even dead-panned about how they enlisted a professor at the university in Portland to help with the pronunciation nuances for Bukra Wba'do, an Egyptian song which Forbes sings on their new album Hey, Eugene. Forbes isn't afraid to to have fun with the crowd at her own expense. Introducing that album’s title song about a guy (whose name was presumably Eugene) that she met at a party in New York who swept her off of her feet and then never called her back, she drew some chuckling from female members of the audience, who obviously related to her anecdote. The lead singer gets occasional help on vocals from other members of the band. In particular, percussionist Timothy Nishimoto on the melancholic Kikuchiyo to Mohshimasu, sung in Japanese, about a geisha who disappears in the fog and never returns. China Forbes concluded the show in similar fashion to the start with an encore performance of Brasil, a Carmen Mirando tune sung in Portuguese. If Pink Martini took us on a world cruise, then warm-up act, Sneakin’ Out took us on a roller-coaster ride with their own concoction of classical, jazz, good ol’ rock n’ roll and humour. David Gerow on electric mandolin, Don Henson on percussion and Mike Schmitt on bass got an already excited crowd going with a medley of Beatles tunes played in double-time. Henson, sporting a Mandinka hairstyle and a red hoop skirt plays a battery of unconventional percussion instruments and embodies the trio’s esprit de corps. His novel use of a portable Olivetti typewriter as a percussion instrument drew an appreciative response from the audience. The band's schtick features the blending of diverse musical stylings into an accordant structure. One such instance was merging Jimmy Page's famous guitar licks from Kashmir with the melody lines from the Beatles' Eleanor Rigby. These guys may not take themselves too seriously, but they certainly take their music seriously.